The newest hotspot in Memphis is a liquor store-turned-diner space backed entirely by a group of women entrepreneurs. Memphis is the kind of town where you can go to the liquor store for breakfast. No, not to some kind of weird booze joint that serves a buttery stack of flapjacks alongside Grey Goose and Captain Morgan. The Liquor Store is, in fact, a new old-fashioned diner concept peddling comfort food like all-day breakfast, burgers and cocktails. The husband-and-wife team behind it have just opened its doors on Broad Avenue, the main thoroughfare in a funky Memphis arts district packed with everything from a brewery to a bar arcade to small mom-and-pop shops. And, now, add to that list a diner. A diner called The Liquor Store in a repurposed building that used to be—wait for it—a liquor store. The restaurant’s provenance owes itself to creativity and a sense of humor. Owners Lisa and Luis Toro also own the nearby retail shop City & State—a kind of emporium for makers and artisans both local and from around the country—and they kept running into people who kept asking where they could grab a quick bite to eat nearby. This was a little more than a year ago now, and the district didn't really have much in the way of quick, casual dining joints. It was still a resurgent commercial district in the process of attracting new entrepreneurs. A sense of humor is apparently a prerequisite for these kinds of things. Which also led to an interest in developing a concept that’s about comfort and familiarity and approachability to go with the name. Plus great drinks, obviously. The Liquor Store is a diner, but also an attempt at speaking a specific design language. From the rattan white chairs to the laminate tabletops and bar tops to the glowing bulbs in a grid on the ceiling. A juxtaposition of modern with classic. 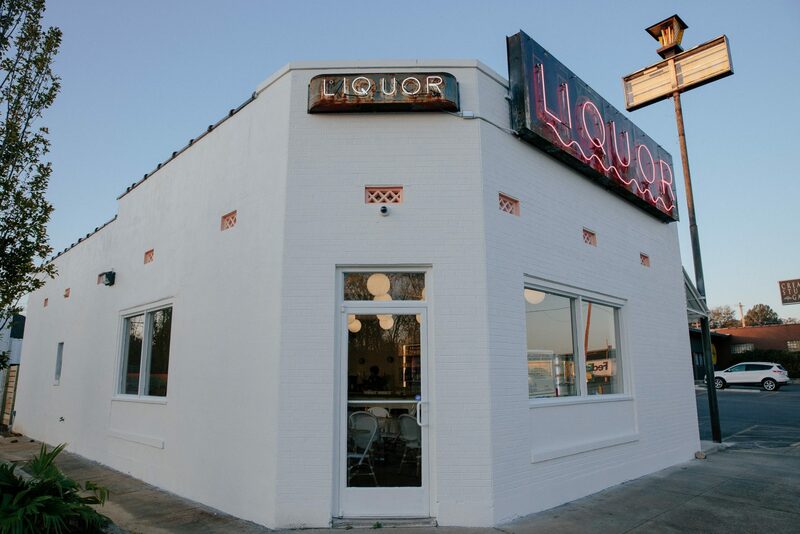 And you’re greeted right out front with a bright vintage one-word sign that announces “Liquor” can be had herein. The breakfast menu, meanwhile, includes staples like a pancake stack and biscuits and gravy. For lunch, you’ve got everybody’s beloved diner standbys: things like a Cuban, grilled cheese, burger, club sandwich, plus snacks like crab dip and loaded fries. Another unique thing about the place is the route the Toros took to get here. Financing is always the tough nut to crack for a small-scale entrepreneur, so the Toros found a group of nine women—fellow entrepreneurs around the city—to buy into the vision and financially back the concept.